Check the table below to find out when WCCLS member libraries will be closing over the holidays. We wish you a safe and happy holiday season! Remember that you can download e-books and audiobooks any time at Library2Go. * Tuality Health Resource Center will be closed 12/24 through 12/27. Please call the library (503-681-1702) in advance if you have any questions about picking up your holds. They will be open on 12/30 and will resume normal hours on January 2nd. 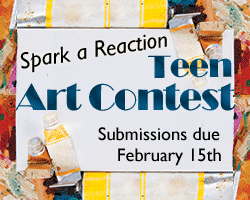 Hey teen artists: Submit a design to our Teen Summer Reading Artwork Contest! The winning design will be used on 2014 Teen Summer Reading program materials across Washington Co., including posters, bookmarks, flyers and more. The winner also receives a $150 gift certificate for Powell's Books. The second place winner receives a $50 gift certificate for Blick Art Materials, and the winner of honorable mention will get a $25 Blick gift certificate. Submissions will be accepted starting January 2nd, and the last day to submit your entry is February 15th. Click here to get all of the contest details and the entry form. (PDF) Good luck!